Bring old memories back to life again. We specialize in transferring your 78's, 33 1/3, 45 rpm's, 8-Track Tapes, Standard Cassettes, Micro Cassettes, DAT Tapes and MiniDisc to CD. Put our experience to work for you. 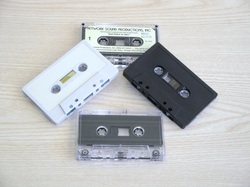 Part 1 of the process transfers the actual audio sound in real time (not high speed) from the analog cassette tape (your tape) to the computer's digital hard drive (computer digital files). Part 2 is the editing process including removing blank spaces (no sound areas), adding track identification marks (CD track numbers), removing tape hiss, noise hum, record pops, enhancing the sound quality and volume levels of the actual recorded program. This process is also known as mastering. Part 3 is the final step which creates your new CD master. All mastered digital files are carefully recorded (burned) to a high quality master CD. Now you are ready for our graphic department.